In Bangladesh, backyard poultry raisers lack awareness of avian influenza and infrequently follow government recommendations for its prevention. Identifying where poultry raisers seek care for their ill poultry might help the government better plan how to disseminate avian influenza prevention and control recommendations. In order to identify where backyard poultry raisers seek care for their ill poultry, we conducted in-depth and informal interviews: 70 with backyard poultry raisers and six with local poultry healthcare providers in two villages, and five with government veterinary professionals at the sub-district and union levels in two districts during June–August 2009. Most (86% [60/70]) raisers sought care for their backyard poultry locally, 14% used home remedies only and none sought care from government veterinary professionals. The local poultry care providers provided advice and medications (n = 6). Four local care providers had shops in the village market where raisers sought healthcare for their poultry and the remaining two visited rural households to provide poultry healthcare services. Five of the six local care providers did not have formal training in veterinary medicine. Local care providers either did not know about avian influenza or considered avian influenza to be a disease common among commercial but not backyard poultry. The government professionals had degrees in veterinary medicine and experience with avian influenza and its prevention. They had their offices at the sub-district or union level and lacked staffing to reach the backyard raisers at the village level. The local poultry care providers provided front line healthcare to backyard poultry in villages and were a potential source of information for the rural raisers. Integration of these local poultry care providers in the government’s avian influenza control programs is a potentially useful approach to increase poultry raisers’ and local poultry care providers’ awareness about avian influenza. Bangladesh is a country of more than 150 million people, with 64% living in rural villages . Approximately 71% of the rural households raise backyard poultry . Bangladeshi backyard poultry raisers come into frequent close contact with poultry every day, including touching poultry while putting them into sheds, feeding sick poultry by hand, and slaughtering poultry . Since its first detection in 2007, highly pathogenic avian influenza A (H5N1) virus has become endemic in Bangladesh . Eight human infections of H5N1 virus have been reported since 2008, including a fatal case . In March 2007, the Government of Bangladesh organized a nationwide mass media campaign through radio, television and newspapers, and conducted public meetings through government veterinary officials at sub-district level to disseminate guidelines to prevent avian influenza infection in humans . Following the campaign, a nationwide survey indicated that 49% of backyard poultry raisers recalled hearing about avian influenza during 2007 . A subsequent nationally representative survey among backyard poultry raisers conducted in 2009–2012 reported that only 40% of respondents had recalled hearing about avian influenza or the government prevention guidelines . Television, neighbors, family, and friends were the main sources of information about avian influenza prevention [2, 6, 7]. These studies also identified that Bangladeshi backyard poultry raisers infrequently followed government recommendations for prevention [2, 6, 7] probably because they did not recognize the disease or consider themselves at risk. The fatal case was reported after these studies, which might have contributed to low risk perception. Nevertheless, these studies suggest that existing communication channels were not optimal for reaching backyard poultry raisers or improving backyard raisers’ disease risk perception. Selecting culturally tailored messages and frequently used local communication networks might help the government improve access to poultry raisers to disseminate avian influenza prevention and control recommendations. In order to improve risk communication to people who raise poultry, this study aimed to identify where backyard poultry raisers sought advice and healthcare for their sick poultry and to explore rural poultry care providers’ knowledge and perceptions about avian influenza. During June through August in 2009, a qualitative research team collected data from one rural village from each of Rajshahi and Chittagong districts [8, 9], the largest and third largest backyard poultry raising area in Bangladesh . Rajshahi in the northwest and Chittagong in the southeast of Bangladesh were chosen to capture practices in two geographically and socio-culturally distinct places of the country. Villages were purposively selected because of their small size, accessibility, and being typical in the region in terms of demographic and geographic characteristics, i.e., agriculture as the main occupation, inhabitant with Muslim majority and located in floodplains. The sites were under surveillance for avian influenza and flocks had yet to test positive for H5N1 virus . To explore where poultry raisers sought advice and healthcare for their sick poultry and the reasons behind their actions, the team conducted informal interviews  with backyard poultry raisers about diverse practices until they reached saturation , i.e., they repeatedly received similar information from different participants. The team conducted in-depth interviews with all local poultry healthcare providers that the raisers mentioned and all the government veterinary service providers assigned to provide veterinary care in these selected villages. The team explored local and government providers’ knowledge about avian influenza, their role in the treatment of ill backyard poultry and their reasoning behind their practices. For the interviews, the team used unstructured guidelines that included topics to explore and relied on the spontaneous generation of questions during the natural flow of conversation . The team invested substantial time building rapport with the informants in an effort to improve the quality of elicited information. The team recorded the interviews using audio recorders and field notes, then transcribed the recorded data verbatim and expanded the field notes. Then they reviewed the transcriptions and field notes to identify the emerging themes relevant to study objectives. They manually coded data according to themes to identify patterns and analyzed these to prepare a summary of each theme/subtheme . They calculated median and inter-quartile range (IQR) for age and conducted Fisher’s exact test to measure the significance of the difference in years of schooling among different groups. The team interviewed a total of 70 backyard poultry raisers, six local poultry care providers and five government veterinary service providers (Table 1). Most (89%, 62/70) of the poultry raisers were female. The median age of the raisers was 38 years (IQR: 30–45). The majority (73%) of the raisers had less than six years of education. All the local poultry care providers and government veterinary service providers were male. The median age of local poultry care providers was 36 years (IQR: 27–43) and government veterinary service providers was 48 years (IQR: 38–52). Among the six local care providers, three had primary, two had secondary or higher secondary education and one had a Doctor of Veterinary Medicine (DVM) degree. Three of the government service providers had DVM degrees and two were Field Assistants in Artificial Insemination (FAAI) who received training on artificial insemination for cattle from government institutions after passing higher secondary examination. The local poultry care providers gave advice free and sold medicine to raisers with sick poultry; four had medicine shops in the village markets, where one can buy products with or without a prescription, and two conducted household visits. Authors deliberately avoided use of the word ‘pharmacy’ because usually a ‘pharmacy’ is the part of the drug store where pharmacists process the prescriptions. In Bangladesh, there rarely exist provisions for the deliveries of professional pharmacy care practices or services in the medicine shops, where one can buy drugs, aspirin, vitamins, tissues and some other related products. One of the two mobile local poultry care providers was a non-government organization veterinarian, who also worked as a private practitioner in the area. Four of the local poultry care providers provided service for both human and animal illness. The government had a livestock office and 1–2 registered veterinarians at each sub-district level to provide animal care. The government service providers were available for poultry care only during office hours (9 am–5 pm). In some sub-districts, there were two types of operations at the union level, which is the smallest administrative unit consisting of several villages, an artificial insemination point and a livestock welfare center. In each of our sites, there was only one field staff; this person mainly carried out artificial insemination of cattle and goats within the union. Field staff did not receive a government salary but used government resources (i.e., office space and equipment) to provide service in exchange for remuneration from the cattle owner. The local poultry care providers were available outside of office hours and on weekends and were more accessible to the backyard raisers than were the government providers. 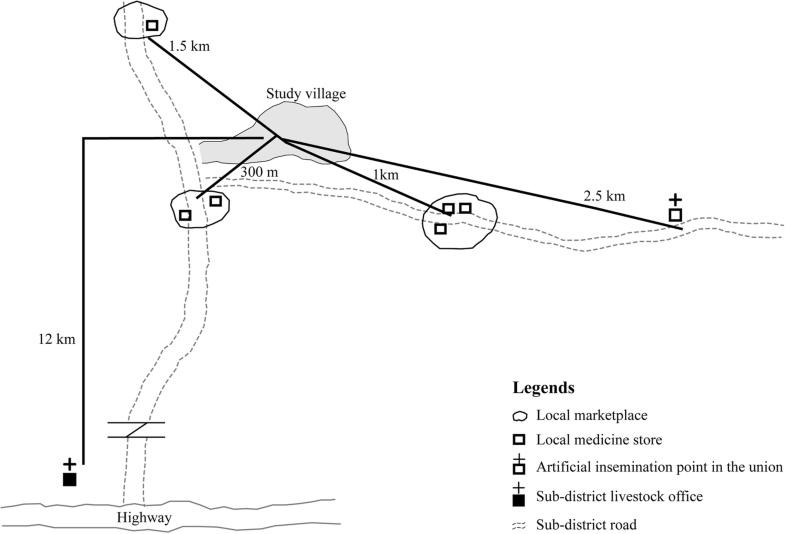 For example, in the Rajshahi study site, there were six medicine shops in three markets within 300 m to 1.5 km of the study village (Fig. 1) and the local care providers lived inside or near the study village. In contrast, the closest government veterinary service was the artificial insemination point, which was 2.5 km away from the study village; the closest sub-district livestock office was located at a city 12 km away from the study village. Ten (14%) of the 70 backyard poultry raisers used only home remedies. Home remedies included feeding and/or applying mustard oil, turmeric, warm rice, onion juice, juice of local herbs/leaves, soap, salt, molasses, chili powder, ginger, garlic and pain-relieving balm. None of the 70 poultry raisers sought care from a government veterinary service provider because government livestock offices were far away and seemed to focus on large animal veterinary medicine. In contrast, mobile care providers visited the village regularly. The following quotes exemplify the preference of the raisers in both villages. Poultry raisers were observed seeking care from local poultry care providers. While a researcher interviewed a mobile local care provider, three villagers came to him requesting medicines, one for a cow, one for a duck and one for a chicken. The local care provider reported that since government veterinarians did not come to the villages, villagers called him and that he had ample ‘demand’ in the area. While interviewing another local care provider at a medicine shop in the local market, the researcher observed that the local care provider provided medicine to the customer and explained the utility of the medicine. These officials stated that there were trainings for the commercial farmers in the sub-district livestock office but not for backyard poultry raisers. The officials mentioned that they offered vaccines against Salmonella and infectious bursal disease for commercial poultry and visited commercial poultry farms in required. However, for backyard poultry, they only offered vaccines against duck plague, duck cholera, Newcastle and fowlpox and did not provide any other service to the raisers. They reported lack of staffing and an inadequate supply of medicines for backyard poultry. A Field Assistant said that people usually came to livestock offices for the treatment of cattle; nearby backyard poultry raisers sometimes visited his office because of poultry health problems but not the raisers who lived further away. These officials reported that they also examined and culled poultry during bird flu outbreaks. An official shared his experience culling chickens during the 2007–2008 bird flu outbreaks. A veterinary surgeon at sub-district level said that they visited one or two commercial farms daily for bird flu but could not go door to door to check backyard poultry or visit backyard raisers because of inadequate staffing. Government providers also mentioned several reasons for raisers’ not coming to government veterinary officials, such as cost of transportation to livestock office, end of the government-sponsored free vaccine program, lack of awareness about government veterinary services and office hours that did not match poultry raisers’ busy working hours. Backyard poultry raisers preferred local poultry care providers to government service providers because local providers lived closer, were available throughout the day, made house calls, were less expensive and dispensed advice and medication upon request. These findings are consistent with a systematic review that identified factors influencing care seekers to use informal providers for human health problems because of their proximity and flexible working hours . Our findings suggest that local care providers could be a more effective source of communication and a more trusted source for poultry raisers compared to government counterparts and could play a role in both raising awareness among the raisers and providing practical solutions to adopt precautionary behavior. Since these local care providers belong to the community, involving them in the communication campaigns might increase community participation, incorporate local perspective to the communication, empower the community, and result in sustainable improvement in awareness and behavior. Concern for financial gain or loss and convenience were common drivers for both the raisers and the service providers. Raisers preferred local care providers because they wanted to save money for transportation to reach government veterinarians. Since the local care providers were part of the community, villagers could easily reach them or the local providers could visit the villagers’ households. Syhakhang et al. showed that 73% of women who visited drug sellers prioritized financial constraints over quality of the drugs in Lao PDR . Repackaging medications into smaller and more affordable units, providing service on credit or accepting in-kind payments when patients do not have cash make the informal providers more affordable for the poor [15, 17]. The local care providers were motivated to serve the backyard raisers for poultry problems as well as human health problems because they recognized the potential to earn a profit by dispensing medicine, as the village doctors reported in another study in Bangladesh . In contrast, government veterinarians did not reach the villagers to provide care for backyard poultry and cited inadequate resource and logistic support as the major barrier. Leonard argued that permitting the government veterinarians to engage in private, fee-for-service practice in Africa provided an incentive to veterinarians to work longer hours in the rural areas . However, providing service for backyard poultry might remain less attractive to government veterinarians than providing service for cattle and commercial poultry (broiler or layer chickens), since those involve higher remuneration. Poultry raisers’ care seeking behavior for ill birds reflects a trusting relationship with the local providers, which might have contributed to their ongoing consultation with them. Informal providers possess a greater degree of perceived accountability than the formal providers because of their proximity to patients; their experiences and track record are all noted within a community, resulting in trust . This trust is evidenced when the raisers reached out to the local poultry care providers for help during 2007–08 when avian influenza outbreaks occurred in many places of Bangladesh. Interpersonal communication is more effective in situations of poor literacy and low awareness than other channels of communication [20, 21]. A study on sources of information and health beliefs related to SARS and avian influenza among Chinese communities suggested that information from trusted sources, such as family and friends, contributed more to the risk perception than information from other formal sources, such as doctors and government agencies . In contrast, despite knowledge and institutional training on poultry healthcare, government service providers were often perceived as distant and unwilling to accept responsibility for their services . In rural Cambodia, farmers were reluctant to have their large animals vaccinated by government veterinary service providers, even when these services were provided at low subsidized costs, but were more willing to have their animals vaccinated by Village Livestock Agents . The lack of government involvement in veterinary care of backyard poultry also means the government may be unaware of poultry die-offs. A study in Nigeria indicated that 57% of respondents with knowledge of avian influenza were unwilling to inform authorities of sudden and massive deaths among their flocks because of fear of culling of birds without compensation (75%) . A survey in Bangladesh showed only 3% of respondents reported unusual poultry deaths to authorities, 73% did not know how to report poultry deaths and 24% did not think reporting was important . As mentioned by a government official in this study, poultry culling activities during avian influenza outbreaks in 2007–08 in Bangladesh had a negative repercussion among the poultry raisers . Poorly executed compensation strategies might have further weakened poultry raisers’ trust in the government and discouraged reporting unexplained flock mortality . Political science scholars have noted that residents of Bangladesh generally view their government as corrupt and primarily serving the interest of government workers rather than the general public . In a nationally representative survey, two thirds of Bangladeshi residents reported paying a bribe to a government official within the prior 12 months . In this low trust context, it is unsurprising that poultry raisers put little trust in government veterinarians. It is difficult to assess appropriateness of the treatments prescribed by local poultry care providers without laboratory diagnosis. The vendors reported dispensing antibiotics indiscriminately, which might increase antibiotic resistance, a global concern for both human and animal health , and a motivation for calls to reduce irrational antibiotic use. Medications are available for most bacterial and protozoan poultry diseases, including fowl cholera (Pasteurella multocida), salmonelloses, infectious coryza and coccidiosis infection [29, 30]. Viral diseases, including avian influenza, Newcastle disease, infectious bursal diseases, and infectious bronchitis, may be fatal for poultry and there is no specific antiviral treatment [31, 32]. Vaccination and improving biosecurity are keys to the prevention and control of infections in backyard poultry [33, 34]. The Government of Bangladesh produces a limited quantity of vaccine for Marek’s disease, Newcastle disease, fowl pox, pigeon pox, fowl cholera, salmonellosis, infectious bursal disease and duck plague , though none of the backyard raisers interviewed in these villages reported using these vaccines. The Drug Administration authority of the Government of Bangladesh has allowed restricted use of avian influenza vaccines for commercial poultry since 2014 , although their use is controversial because vaccinated birds can still become infected and shed viruses with few or no clinical signs of infection . Local healthcare providers have been previously identified as an important source of healthcare services and influence customers’ care seeking behavior for human illness in low income countries [38–41], including Bangladesh, particularly among rural, poor and underserved populations [15, 42]. A systematic review reported that educational interventions, including capacity-building training programs for informal healthcare providers, was the most common recommendation by the authors . Lack of academic or institutional training decreases the appropriateness of local healthcare providers’ recommendations [39, 40]. Recognition of a legitimate role for these informal providers is likely to provoke resistance by government sanctioned professionals which play the role of “a guarantor of standards” but are also strongly motivated to secure profits, power and privilege . National health development strategies have typically ignored the existence of informal healthcare providers , which might result in little support to backyard poultry raisers in resource-poor settings. As Sims argues, in a country like Bangladesh, certain factors, such as complex nature of the poultry production and marketing systems, limited veterinary capacity and low level of commitment from the raisers to country-wide elimination of virus to central government, favored persistence of virus . In such a scenario, co-operation between government service providers and local care providers rather than mutual exclusion, might be a better approach [18, 42] to increase veterinary service capacity to communicate recommendations to prevent avian influenza and promote biosecurity. This research was conducted in only two sub-districts, so it may not be representative of all backyard poultry raisers or veterinary care providers of Bangladesh. Nevertheless, since responses from our study participants are consistent with behaviors of care seekers and care providers in other Bangladeshi rural communities for poultry [45, 46] and humans [17, 41], these findings are likely applicable to other similar settings. Some government veterinary service providers were reluctant to share information and the team could not corroborate some of the assertions villagers or local care providers made. The study was conducted in 2009 and there was only one reported H5N1 case prior to the data collection of this study, hence it is possible that occurrence of the latter cases, including a fatal one, might have influenced raiser’ risk perception and care seeking practices since then. However, since we did not find substantial differences in people’s awareness on avian influenza reported in surveys conducted in 2007  and 2014 , we assume that our conclusions remain applicable. Another qualitative study that explored biosecurity practices among small commercial chicken farms during 2011–12 showed similar reliance on these local care providers . For a resource-poor country like Bangladesh, the local poultry care providers play an important role in providing care to backyard poultry in villages. The credibility of these vendors is linked to their relationship with the poultry raisers and reinforced by the structure of incentives. These vendors could be a useful channel to implement health promotion interventions among backyard and small commercial poultry raisers  because they serve both groups and are available at the village level all over the country. Local poultry care providers might also serve as a bridge between government authority and the rural raisers, since they are the persons to whom raisers reach-out for help when their birds are sick. Developing interventions to increase the knowledge and skill of these local vendors through institutional training and integrating them in the government’s avian influenza control programs is a potentially useful approach that should be evaluated. Field Assistants in Artificial Insemination. We are grateful to our study participants for their time and invaluable information. We thank Marufa Hasin, Afroza Khanam Roza and Md. Zahidur Rahman for their valuable contribution in developing guidelines and data collection and Mahbub ul Alam for his contribution in drawing the location map [Fig. 1]. We also thank Rashid Zaman for their contribution in developing the research protocol. We thank Diana DiazGranados for editing the manuscript. We thank Jerome Tokars, Susan Trock, and Sonja Olsen for their thorough and expedient feedback. This research was funded by the Centers for Disease Control and Prevention (CDC) (https://www.cdc.gov/) under the Cooperative Agreement Grant 5-U51-CI000298. icddr, b acknowledges with gratitude the commitment of CDC to its research efforts. SPL received the funding. The paper was reviewed and cleared for publication by independent CDC staff who were not involved in study design, data collection and analysis, decision to publish, or preparation of the manuscript. The opinions expressed by authors contributing to this journal do not necessarily reflect the opinions of CDC or the institutions with which the authors are affiliated. icddr, b is also grateful to the Governments of Bangladesh, Canada, Sweden and the United Kingdom for providing core/unrestricted support. NAR, RS, EAB, NN and SPL conceived and designed the study. NAR and KIA contributed to data collection. NAR, RS, KIA, NH and SPL contributed to data analysis. NAR lead the writing of the manuscript, SPL guided the writing as the senior author and all authors contributed to writing the manuscript. All authors read and approved the final manuscript. We received approval of the study protocol from icddr, b’s Ethical Review Committee (FWA # 00001468, Human Welfare Assurance # 00001822). All participants provided verbal informed consent for enrollment into the study. A Centers for Disease Control and Prevention (CDC) institutional review board concluded that the agency was not engaged with human subjects in this project. Agriculture & Rural Development https://data.worldbank.org/indicator/SP.RUR.TOTL.ZS?display=graph&locations=BD. Accessed 15 July 2018. Cumulative number of confirmed human cases for avian influenza A (H5N1) reported to WHO, 2003-2018. http://www.who.int/influenza/human_animal_interface/2018_05_28_tableH5N1.pdf?ua=1. Accessed 15 July 2018. Follow-up report No 43 (Final Report). http://www.oie.int/wahis_2/public%5C..%5Ctemp%5Creports/en_fup_0000014568_20131223_145541.pdf. Accessed 15 July 2018. Bangladesh: avian influenza immunization Program http://www.poultrymed.com/Poultrymed/Templates/showpage.asp?DBID=1&LNGID=1&TMID=178&FID=1585&PID=0&IID=3418. Accessed 11 Nov 2015.